The Men’s Intercontinental Phase was carried out between 29 June and 03 July 2011 in Jaipur, India. 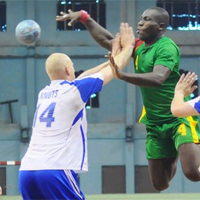 IHF Challenge Trophy competitions are a unique occasion for smaller handball nations to take part in an international handball competition. The tournament of the Men’s Intercontinental Phase was carried out between 29 June and 03 July 2011 in the "Pink City" of Jaipur, India. This tournament for players born 1990 and younger included the five winners of the tournaments of the Continental Federations. The European Federation was represented by the national team of Finland, who won the final of the IHF/EHF Challenge Trophy against Georgia on the occasion of the Men’s EHF EURO 2010 in Austria. Finland had to take on the hosting nation India (Asian Continental Federation winners), Australia (Oceanian Continental Federation winners), Benin (African Continental Federation winners) and Venezuela (Pan-American Continental Federation winners). Finland are the deserved winners of the first ever IHF Men’s Inter Continental Challenge Trophy. Throughout the event, they were the most consistent team and managed to clearly win all of their five games. Their last match against Australia brought them another easy victory and brought the trophy to the representative of the European federation.